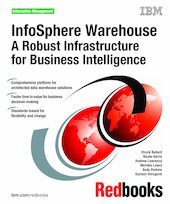 In this IBM® Redbooks® publication we describe and demonstrate Version 9.7 of IBM InfoSphere™ Warehouse. InfoSphere Warehouse is a comprehensive platform with all the functionality required for developing robust infrastructure for business intelligence solutions. It enables companies to access and analyze operational and historical information, whether structured or unstructured, to gain business insight for improved decision making. InfoSphere Warehouse solutions simplify the processes of developing and maintaining a data warehousing infrastructure and can significantly enhance the time to value for business analytics. The InfoSphere Warehouse platform provides a fully integrated environment built around IBM DB2® 9.7 server technology on Linux®, UNIX® and Microsoft® Windows® platforms, as well as System z®. Common user interfaces support application development, data modeling and mapping, SQL transformation, online application processing (OLAP) and data mining functionality from virtually all types of information. Composed of a component-based architecture, it extends the DB2 data warehouse with design-side tooling and runtime infrastructure for OLAP, data mining, inLine analytics and intra-warehouse data movement and transformation, on a common platform.